I have been invited to a wedding in October and I have already started looking at outfits and shoes, trying to decide what to wear. For this wedding I have been invited to both the ceremony and subsequent wedding breakfast, going straight through to the evening celebration at another location. Which poses a problem. What do you wear that is going to work for both parts of the wedding, at different times of day? Here are some tips that I think will get you through a wedding with style and without offending the bride! If you have been invited to a wedding, chances are that it is going to be a formal event (unless it is on a beach, then you might get a little leeway!). So this is not a time to bring out your jeans. Have a really good shop around for something formal, but also ideally something that you can wear again or style up to give you different looks. No white please! For the summer months, why not go with a mid length fishtail dress in a bright colour? This one from SimplyBe is an absolute steal at £25.00. 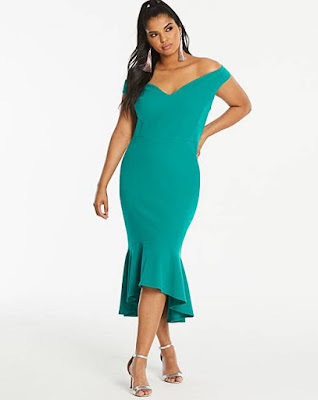 As the wedding that I am going to is in October so I am looking for something a little more covered, but still stylish. I love the River Island dresses that are around at the moment and am in love with this one which is very reasonable £65.00 and could be worn to a variety of events, not just a wedding. Chances are, if you have been invited to both the day and evening events of a wedding, you are going to be on your feet, a lot. There are a few different things to think about here. You need a pair that are going to work for both day and evening wear. Glitzy glitter covered heels look fab underneath a disco ball but not so much in a pew at a church. You want a heel height that still looks elegant and stylish, whilst also not being too high. They have to be comfortable enough to wear the shoes for hours on end without killing your feet and of course, you have to be able to dance in them (after you have negotiated uneven flooring outside churches, cobbled streets etc). Try to go for neutral tones or black. Matching that perfect colour of jade green from your dress may seem like a fab idea at the time, but you want to wear a shoe that you can wear again with other outfits (thereby justifying paying slightly more than usual for a gorgeous pair!). 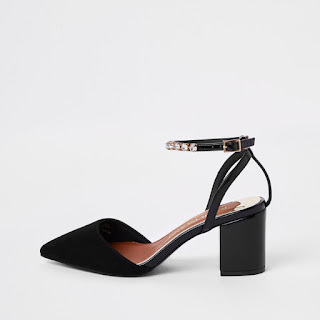 I am loving these shoes at these black diamante shoes from River Island at the moment which have just a touch of sparkle and have a manageable, block heel which shouldn't prove hard to walk in. When you are going to day and night event, probably surrounded by many people that you do not know; the urge to have a few more drinks than usual to "ease you up a bit" is an easy one to succumb to. I know only five people at the wedding I am going to in October and that includes my plus one! Everyone has a few too many drinks at weddings but make sure that you eat something at the wedding breakfast, have a nibble at the buffet later in the evening. Tripping the light fantastic on the dance floor is one thing at a wedding, but there is always one that gets too inebriated and can potentially spoil a couple's wedding day. Don't let that be you!